During this workshop, you will be experiencing Reiki Attunement by Master Surjit Singh Khalsa. 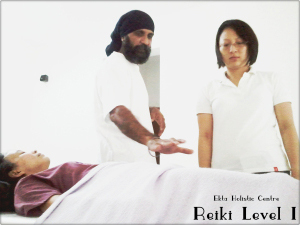 You will be learning the art of Reiki Healing - which is also known as "palm healing". Come join us to learn how to heal yourself and others around you using this powerful healing Energy.
" Reiki (éœŠæ°—),is a spiritual practice developed in 1922 by Japanese Buddhist Mikao Usui. It uses a technique commonly called palm healing as a form of complementary and alternative medicine and is sometimes classified as oriental medicine by some professional bodies. Through the use of this technique, practitioners believe that they are transferring healing energy in the form of ki through the palms. " 2. Reiki is the highest form of healing energy, it is always safe and can never harm. 3. Reiki lasts a lifetime. Once you have the attunements, regardless of whether you use the energy consciously or not, it is always with you. 5. Reiki can be successfully combined with other healing methods and is a useful tool to have, which can be incorporated into daily life. It does not conflict with religious beliefs therefore it is a teaching that can be used by anyone.